How Snake River Farms Works? What Makes Snake River Farms Different? How Easy Is Snake River Farms To Follow? Snake River Farms is a high quality meat delivery service that delivers pork and meat to various Michelin-starred restaurants. The venture is by an Idaho based company called Agri Beef that has been there since 5 decades. Snake River Farms is known for its exceptional beef cuts that go way beyond the USDA Prime standard. This service is for meat lovers who want nothing but the best. All the steps from ranch to table are professionally supervised. In this way, people jacking up prices in between are eliminated. Along with that, it provides an assurance about the quality of meet delivered. Reviewing Snake River Farms on Food Box HQ was a pleasant experience as they only select cattle raised in the Northwest to produce beef. This is helpful as the cattle there are fed on a variety of edibles. They experience a better climate due to which the produced beef is more flavorful. In addition to that, cows there are subjected to better treatment. A lot of people do not care about this factor but it does affect the taste of meat and its quality. According to researches, animals that are stressed do not produce meat with good taste. Snake River Farms provides American Waygu beef and Berkshire hogs to the top most restaurants in America. From the year 1968, the cattle they use are being raised in Idaho along the Snake River high plain. The business was family owned and started with a small cattle herd which was brought from Kobe in Japan. The Japanese cattle were popular for being flavorful and soft. It was crossed with American Black Angus to come up with a new herd breed. According to chefs, this herd was rich in terms of flavor. The meat cuts all the farms of Snake River are wet aged for a time span of 28 days. This restricts the air exposure level and makes the end product meat juicier. To figure out why meat lovers in America are in absolute love with this meal delivery service, you should go through the remanding part of this Snake River Farm review. Keep reading our honest Snake River Farms review to learn more. People who want to avoid frozen meals and opt for a healthier option instead. Snake River Farms are recommended for people who want present a carnivorous friend with a great gift or pamper themselves with the finest beef or pork. This service is not subscription based which simply means that can make a purchase when you feel that the need is there without following any commitments. You can view the products available, add them to the cart, select the quantity and checkout for payment. The last thing you need to do is impatiently wait for the scrumptious meat to be delivered. Snake River Farms offer more than 150 items. These include dry-aged beef, Northwest, American Waqyu, Kurobuta Pork which is equal to Kobe Beef. Along with that, there are BBQ cuts and various gift packs. The products are categorized properly so that customers can make a selection easily. Customers do not need to follow any limitations in terms of the meat quantity that can be ordered. There is no minimum ordering value. You do not have to procure meat more than your requirement. Shipping is not very high so you do not have to unnecessarily order a specific minimum quantity. You can place an order according to your need. Snake River Farms is preferred over its competitors due to two key reasons. One of them is the meat quantity that it offers and the other is the farm to table strategy used by the company. It is mentioned earlier in this review that Snake River farms produces the best meat available. 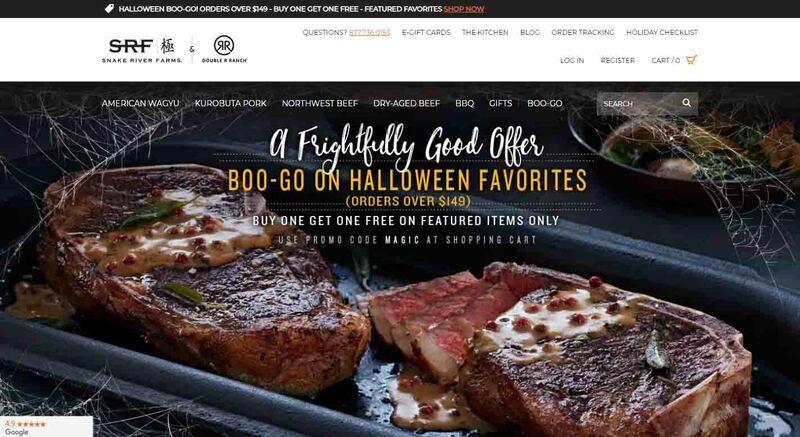 The company uses the finest Waygu/Angus cattle for its meat. These cattle are fed on high quality balanced diet which includes grains, potatoes, forages and renewable feeds. The company uses the best food practices implemented at the top level. It has been awarded certifications from USDA (United States Department of Agriculture) and the GFSI (Global Food Safety Initiative). The facilities used for meat processing have been approved and certified by HACCP, ISO and USDA. Snake River Farms does not compromise on the meat quality in anyway. It has involvement in the entire farm to table life cycle of the meat. The goal is to ensure that the finest quality meat is provided and handled according to the best food safety standards. The company supervises a lot of areas including sales, feeding, ranching and processing. Hence, customers of Snake River Farms do not have to purchase meat from resellers. Instead, it is purchased from meat experts who work on the wellbeing of animals and the serve customers with immense happiness and satisfaction. In a nutshell, the meat quality delivered by the company is incomparable. If you want to buy meat for a dinner that has been planned for a long time, Snake River Farms is the place you need to go. Snake Farms offers highly impressive surprise gifts. The gift categories include special occasion, business, thank-you and grilling. Along with that, customers should keep their eyes on the savings section so that they do not lose an opportunity to save money. There is no doubt that Snake River Farms aim at making the customer happy. Hence, if the good delivered to you are damaged or fall below the company standard for quality, product size of any other feature, you can contact the support team within a time span of 30 days after receiving it for refund purposes. There are six basic meat types including American Wagyu, Kurobuta pork, Northwest beef, BBQ, specials, and dry-aged beef. The Wagyu section includes 60 mouthwatering items that have been prepared by the finest chefs who have won awards. You can place orders for various items including ribs, burgers, dogs, roasts and briskets. All these products contain the best Wagyu. Along with that, you can also purchase specialties including black-grade culotte. In terms of quality and flavor, Kurbota pork is simply outstanding. Only the finest 100% Berkshire Hogs are used to produce it. There are 20 items in the Kurbota section of Snake River Farms including hardwood smoked bacon, roasts, ribs and chops. Along with that, there are speciality items including Kurobuta crown roast or prime pork rib. Snake River Farms produces the best standard beef that comes from the heart of Northwest. This beef is tender and has an amazing flavor. Users can select from 50 options available including roasts, steaks, tenderloin medallions and burgers. The BBQ section of Snake River Farms includes 40 grill friendly cuts. The product categories include Northwest beef, Kurobuta Pork and American Wagyu. Customers can go through the competitive BBQ section and final several product options which your family and friends would love. You can choose from 10 items in the specials section. You can get your hands on various mouth-watering products including black-grade flank steak American Wagyu, Kurobuta spare ribs and several other options. This is the most recently added section which includes USDA Prime Beef and American Wagyu. These products have enriched texture and flavor. This dry beef is produced in partnership with Prime Food Distributor. It assures an amazing eating experience to the customers. Before these meat cuts go into packaging and shipping, they are wet aged for a time span of 21 days. Wet-aging refers to a process in which meat is marinated in its own juice and it is not exposed to air. In accordance with Snake River Farms, this practice makes the meat softer and juicier. When we went through the taste test, it was obvious that this was a fact. The items that can get spoilt are shipped in frozen state. They are delivered in chilled, partially defrosted or frozen state. It is fact that Snake River Farms uses the best methods to ship the products in a proper refrigerated environment. Even then, at times, meat gets defrosted before it is delivered to you. If the meat has not been defrosted properly, you can freeze it again without being apprehensive about its quality. On the other hand, if the meat has been defrosted completely, you cannot freeze it. Instead, place it in the refrigerator and use it within time duration of 5 to 7 days. Every ordered meat cut shows the methods that Snake River Farms takes to retain safety and meat quality. We were simply mesmerized in terms of tenderness and juiciness that the meat had. There is a definite difference between the meat sold by Snake River Farms and what is available at stores. You can feel this difference as soon as you take the first bite. Snake Rivers Farms ensure that the finest cattle which have been fed with nutritionally balanced diet is used. This is the key reason by the meat cuts offer a completely different level of taste. However, the taste also depends on whether it has been cooked properly or not. You can get assistance from Snake River Farms for this purpose. You have to perform a physical moving activity for a time span of 30 to 60 minutes per day. However, you can select the activity and time slot according to your suitability. Users would find the website of Snake Farms easy to use and attractive. If you are seeking attractive gift options, you would find a good collection. You can find economical priced packages to premium alternatives and gifts for business. In other words, there are several products according to diverse customer preferences. If you are ordering more than 5 gifts, you would be eligible to opt for custom gifting options. Visitors can also get find cooking recipes and guides which prove to be helpful for cooking purposes. Snake River products are not economical in terms of price. However, there are products that fall within the budget of everyone. For instance, you need to pay USD 49 for 5lbs of mouthwatering hot dogs. Similarly, it would cost you USD 23 for 2-lbs of Kurbota spare ribs. If you have a price range of USD 999, you can get the Gold Standard Maxi Pack. This pack has various gold grade cuts of American Wagyu including rib coast, cap of rib eye, Manhattan fillet and filet mignon. The quantity of all these products is 6 to 8lbs. Customers have to pay additional charges for shipping. The cost depends on what has been ordered. The price range is from $9.99 to $79.99. When it comes to delivery, Snake River Farms delivers in all 50 states of USA. However, there is no shipment service for Puerto Rico, Guam and other US territories. Secondly, there is no delivery to PO and APO / FO boxes. FedEx and UPS are used for delivery and the time requires is 1 to 3 business days. There are multiple shipping options including standard shipping and express shipping. If you opt for shipping on Saturday, an additional USD 15 would be charged. To get additional help, you can go through the FAQ page or get in touch through email and telephone number. As a conclusive statement, we can say that Snake River Farms offers the finest beef and pork which helps in having an amazing dining experience at home. The standard and quality is way above expectation. There are numerous options available to select from and you can make purchases within an economical budget according to your taste requirements. The meat gift options simply stand out and customers do not need to spend long hours on making selections for their friends who love eating meat. Refunds: If you receive product you believe is damaged or defective, report it to us immediately, and our team will gladly assist you in starting a claim for replacement/refund. Whether you talk about the best Kurobota Pork or the best American Wagyu Beef, Snake River Farms offers the finest meat in America with more than 150 items to select from. Luxurious beef meals delivered to your door step. For the company, the most important area of focus is providing the finest beef and pork in US. This focus has been improved since the creation of the company in 1968. We found 7 verified Snake River Farms Discounts, Coupons and Promo Codes for Feb. 2019. If some of the Snake River Farms coupon codes have expired, please contact us, thank you for your help. If you like Snake River Farms but aren't sure whether it's the best ideal choice for you, and may want to compare Snake River Farms with other Companies' Plans, Products, and Services that similar to Snake River Farms, or Snake River Farms Alternatives and Snake River Farms Competitors, Which companies' services like Snake River Farms. You can take a look at our professional comparisons below to discover if one of them is more suitable for you.